Every copy of Warlords of Draenor comes with a single character boost – enough juice to have you wearing that level cap sideways with the cool kids, you might think. But just as you hit level 90 on November 13, the game will push back the limit another ten levels. You’ll need to find another way to scale those final ranks. Enter four new WoW level-up dungeons – and beyond those, another four max-level dungeons, including one that’ll arrive early. The Upper Blackrock Spire is one of Draenor’s max-level dungeons – a mountain“rife with history” and now under new management: the Ironmarch Vanguard. Three of the Spire’s five new bosses will be made available to level 90 players in a pre-expansion version of the dungeon. There’s no current ETA on that, but we’ll keep you posted. 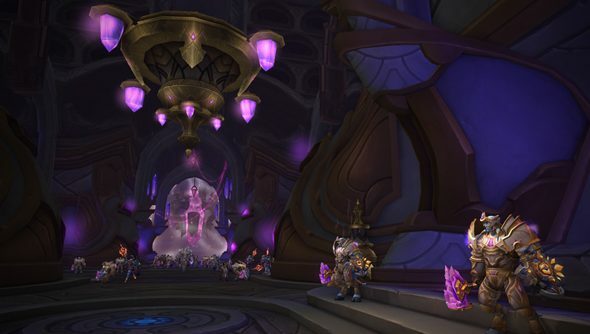 Draenor’s four levelling dungeons lead naturally from one to the next. The volcanic Bloodmaul Slag Mines are intended for levels 90-92; the horde’s Iron Docks cover levels 92-94; Auchindoun, the holy mausoleum of the draenei, fits 94-97; and the cloud-nestled Skyreach will handle level 97-99. That’s one more than we might have had: the Iron Docks began life as a PvE quest area, until the dev team decided its massive warships and oil slicks would make a great “backdrop and play space” for a dungeon. Each levelling dungeon will be populated by four new bosses, and pick at an underexplored aspect of WoW lore. The four remaining new dungeons are all pitched at level 100, but boast distinct personalities. The Shadowmoon Burial Grounds are decorated with angry ancestral spirits stirred up by an apocalyptic plot, and The Everbloom is staffed by sentient plants with “the power of nature in their hands – literally”. The Grimrail Depot promises fast-paced action on a moving train, while the Upper Blackrock Spire conceals the Iron Horde’s “doomsday weapon”. Do you think you’ll have a scuffle in the pre-release version?